From time to time intergroup encounters occur. 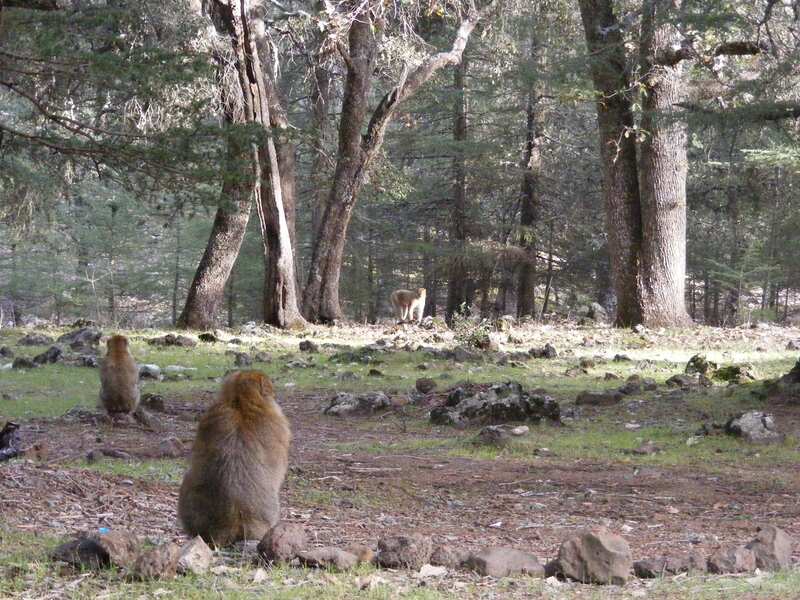 Home range sizes for Barbary macaques in The Middle Atlas region encompass in general a few km2 (the smallest home ranges for this species), and they overlap with other groups´ (Fooden 2007). One usually notices an intergroup encounter by spotting a “frontline” i.e. a few monkeys sitting and staring in the same direction. In this frontline of brave soldiers you typically find 2-3 adult males and almost certainly males juveniles (Mac and Simon in the Green group, Oliver and Fagan in the Scarlet group). These juveniles are often the first to form the frontline, courageously willing to defend the honor of their group. However, they are ironically also the first to get startled and give ground if one from the other group shows even the slightest attempt to start a real confrontation. Most of the IGE´s are passive and resemble a Mexican stand-off, with the two groups staring and assessing each other. These encounters can last for hours, until one group decides it´s time to move on. Sometimes a full on fight brakes out, and those can get nasty. By now we know more or less which other groups are close by or have overlapping home ranges. We recognize group members and have named some of the groups for our own record. Simon and Oz in a intergroup encounter the other day. In the background you can see a member of the other group. Photo by Chris.